Kubeni pairs strong interpersonal skills with her strong critical thinking, data analytics and project execution to deliver excellent results. In her role as a Consultant at Symmetra, Kubeni employs an intelligent, creative, methodical and conscientious approach to designing and implementing Symmetra’s suite of inclusion products and services. 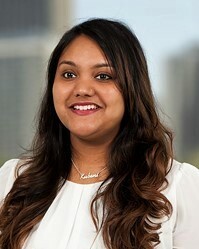 Prior to joining Symmetra, Kubeni gained extensive experience across a range of industries whilst working at Deloitte Australia, including Media, Consumer Product, Telecommunication and Energy Resource. This exposure enabled Kubeni to develop strong commercial acumen and stakeholder management capability in a variety of business contexts. Kubeni graduated from UNSW Australia with a Bachelor of Commerce majoring in Accounting and Finance and is also a qualified member of Chartered Accountants Australia and New Zealand (CAANZ).